Sign into your account at Google Analytics account. 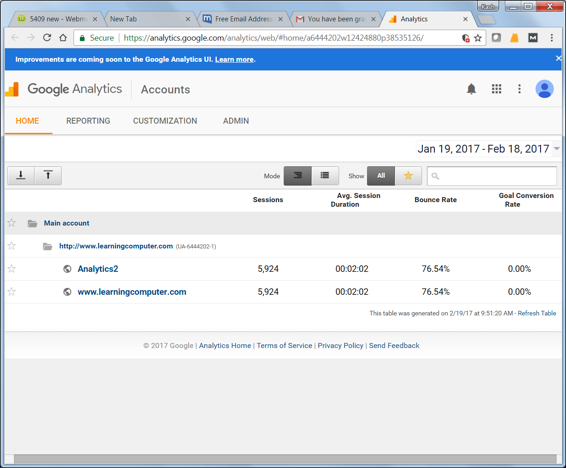 Go to http://www.google.com/analytics/ and click on the Access Analytics button to sign in. If you are using your own Google Analytics account, then log in using your username and password. 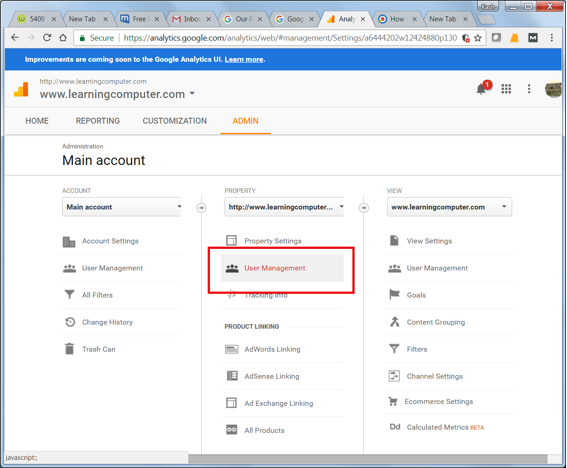 Manage Users Can manage account users (add/delete users, assign permissions). Does not include Edit or Collaborate. Edit Can perform administrative and report-related functions (e.g., add/edit/delete accounts, properties, views, filters, goals, etc., but not manage users), and see report data. Edit permission is required at the account level to create filters. Edit permission is required at the view level to apply filters. Collaborate Can create personal assets, and share them. Can collaborate on shared assets, for example, edit adashboard or annotation. Includes Read & Analyze. 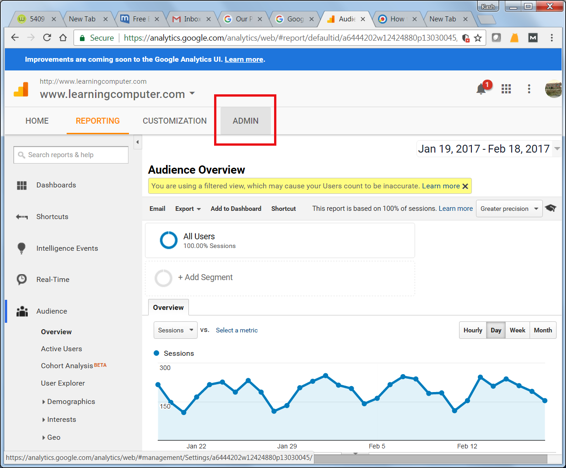 Read & Analyze Can see report and configuration data; can manipulate data within reports (e.g., filter a table, add a secondary dimension, create a segment); can create personal assets, and share them, and see shared assets. Cannot collaborate on shared assets. 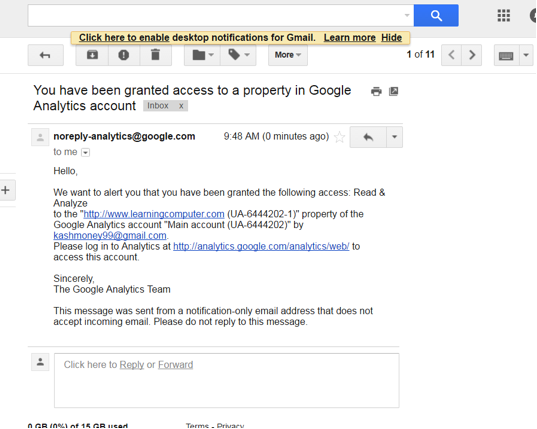 Please log in to Analytics at http://analytics.google.com/analytics/web/ to access this account. 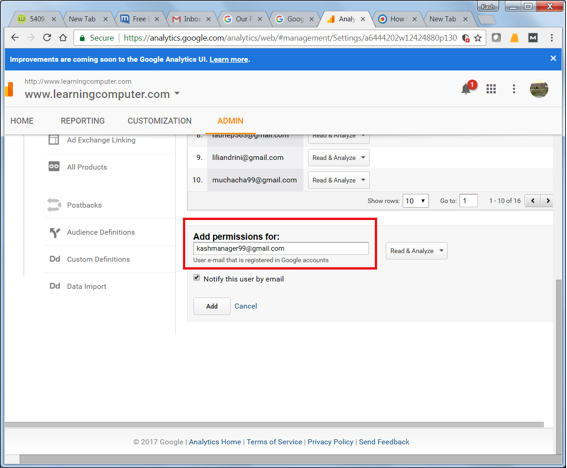 I hope you have enjoyed these 7 easy steps how to grant permission to your Google Analytics account. Please visit us at http://www.datatechnologyllc.com/google-analytics/ for more information about Google Analytics. If you have any questions or need help, you can Contact Us. Our Search Marketing firm, Kash Data Consulting LLC, is specializing in providing Google Analytics services and training in Dallas, TX. Our Online marketing experts have years of practical experience in SEO, Google Analytics, Google Adwords, Social Media Marketing, You Tube Optimization and Content Writing with WordPress CMS in Plano, Frisco, Allen and surrounding DFW Metroplex areas.